Family law mediation, also known as Family Dispute Resolution, is a process option available to parents to try to negotiate post separation parenting arrangements that are in the best interest of their children. It also encourages separating couples to parent cooperatively, rather than through other process options such as Court that can create conflict. There has been abuse of the child, or there is a risk of abuse. If the mediation is run by an authorised Family Dispute Resolution Practitioner, they can then issue a certificate that allows you to file an Application in Court if you can’t reach an agreement and have either attempted mediation or fall under one of the exceptions. “encourage early and full disclosure through the exchange of information and documents about the prospective case. Mediation is just one of the many options available to help you to come to an agreement about parenting matters, and avoid Court. 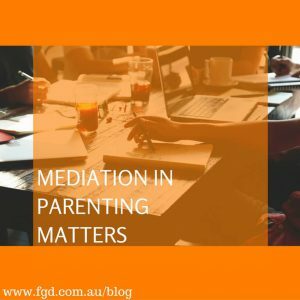 We have qualified mediators and lawyers trained specifically in assisting parties in the mediation process, so please contact our team if you are thinking about exploring mediation as a process for coming to agreement about your parenting arrangements.